Your fleet arrives at the scene of a massacre of several ships of unknown origin. You’ve been tasked with recovering anything of interest from the scene in order to bolster your fleet as well as preventing any opposing factions from gathering anything potentially harmful. As you start moving through and scanning the remains of the ships, your sensors detect an approaching enemy fleet. You must recover as many of the resources as possible while fending off your foes and preventing them from doing the same! Will you succeed in your venture or will you fail and let your enemies salvage potentially deadly technology to use against you in the future? 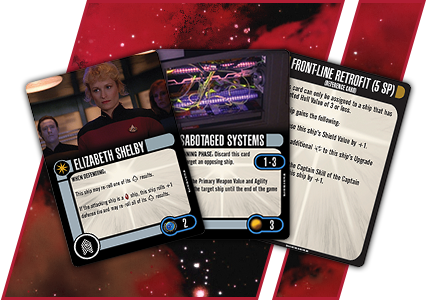 Find a local game store that is running the Star Trek: Attack Wing: Resource Rumble Organized Play event series at the WizKids Info Network. © 2017 WizKids/NECA, LLC. WIZKIDS, HEROCLIX, and COMBAT DIAL are trademarks of WizKids/NECA, LLC. All rights reserved. TM & © 2016 CBS Studios Inc. STAR TREK and related marks are trademarks of CBS Studios Inc. All Right Reserved. FLIGHTPATH is a trademark, and FANTASY FLIGHT GAMES is a registered trademark, of Fantasy Flight Publishing, Inc. All rights reserved.